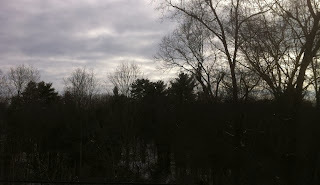 On this January morning I was looking out my home office window and had one of those amazing little moments. One of those moments of insight and introspection that may mean nothing to anyone else, but which brought tears to my eyes. 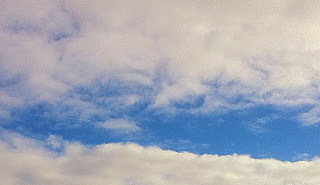 I looked out my window seeing the grey, gloomy sky, then gazing higher above, almost straight up, I saw clear blue sky. Such a gorgeous expanse of limitless blue with white puffy clouds zooming by. The clouds were moving so fast it looked like a time lapse film that compressed the cloud movements of an entire day down to seconds. I looked back at the horizon - the grey clouds sitting there motionless. In the peripheral vision of my right eye, I could see dark, ominous trees. I turned to them to see a field of leafless, dark shapes with translucent rays of light poking though, giving the branches ominous highlights. It was rather eerie and menacing, a bit of a traditional Halloween scene. I realized all of this was happening at the same time. All of these scenes, these views, were real; and my mood, my emotions, my outlook, changed depending on which one I focused. The overall scope was too grand for me to see all three aspects at the same time. I had to choose what I wanted to see; what I wanted to focus on. I got to choose what I wanted to experience. The sky is always blue. It is the clouds that are sometimes grey. The sun is always shining, we just don't always see it. Life is always good, we just aren't always aware of it. Sometimes we are deceived by the filters, the clouds, the temporarily leafless, scary trees. It is all good.